In this special section, “Preparing the Workforce—Today and Tomorrow,” you’ll find trends, practical strategies, and food for thought. The articles are designed to help nurses in all specialties and at all levels who face myriad workforce challenges, ranging from a growing older population to the impending retirement of many experienced nurses. 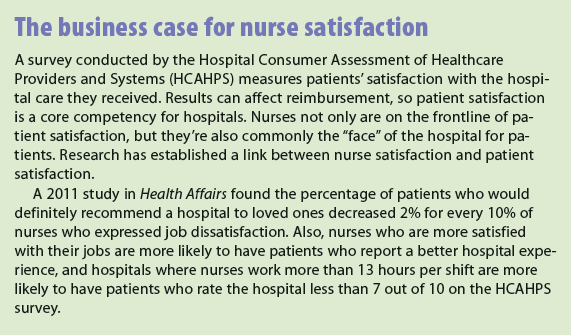 For my own contribution, I’d like to focus on the business case for an optimal nursing workforce. A critical success factor for healthcare organizations is the efficient use and retention of a talented workforce contributing to clinical and operational excellence. Leading performance organizations use a multidisciplinary team whose members understand the urgency of addressing current workforce issues, such as staffing and scheduling systems, professional development, innovative work design, and recruitment and retention programs centering on multigenerational challenges. use of workforce data to develop long-term clinical improvement strategies. Labor remains the largest expense for healthcare organizations. But labor’s ability to affect a hospital’s success extends far beyond the bounds of a profit-and-loss statement. A growing body of evidence supports the workforce’s impact on physician, staff, and patient satisfaction—and ultimately, on revenue and quality of care. Optimizing workforce management also promotes operational and clinical excellence in ways not always considered, such as staff morale improvement to promote quality of care. Here’s a closer look at the data and research findings related to business aspects of three key workforce elements: the link between overtime and both turnover and injury, the impact of agency nursing, and the need to free managers from outdated systems. For most hospitals, nursing overtime is the rule, not the exception. According to industry surveys, more than 50% of full-time nurses work an average of 7 hours of overtime each week, and 15% of part-time nurses work an average of 5.4 hours of overtime weekly. With this pattern, 7% to 10% of total worked hours are overtime hours. From a business perspective, overtime has several negative consequences. Turnover is an ongoing challenge. Nurses who work more than 12 hours in a shift and 40 hours in a week are prone to job dissatisfaction and quitting. Nurses who work shifts longer than 12 hours are nearly 1.5 times more likely to leave their positions within a year than nurses who don’t. Because 12-hour shifts are becoming the norm and with nearly half of full-time nurses logging overtime, unmanaged overtime can accelerate costly turnover. What’s more, replacing nurses who leave is expensive. In research initially published in the Journal of Nursing Administration in 2008, researcher Cheryl Bland Jones, PhD, RN, FAAN, outlined what is now considered valid data and used as industry norms related to the cost of RN turn­over: $82,032 per experienced registered nurse (RN) and $88,006 per new RN. Working in jobs with overtime schedules is associated with a 61% higher injury hazard rate than working in jobs without overtime. Working at least 12 hours per day is linked to a 37% increased injury rate—and with 50% of full-time nurses falling into overtime buckets, hospital exposure to injuries increases. Alarmingly, healthcare workers’ injury rates are almost twice those of the norm, and injury costs hit the organization’s bottom line. A deep body of literature has established a significant link between overtime and patient safety. Currently, most organizations are unable to track these correlations. As nursing shifts lengthen, so do the chances of medical errors. An often-cited study by Rogers, et al. found that the odds of making an error are three times higher when nurses work more than 12.5 hours. A multistate study by Bae confirmed the greater likelihood of errors in nurses who surpass a 40-hour work week. These nurses were 3.71 times more likely to make medication errors. Clearly, such incidents are linked to decreased quality of care. Based on average costs and incidence, ﬁnancial exposure stemming from medical errors runs upwards of $30 million per year for a 300-bed hospital, much of it unreimbursed. Scheduling and bed management are complex and time-consuming for managers. A recent KRONOS study found nurse managers spend up to 80% of their day on staffing, scheduling, and bed management, done mostly with paper-based systems. This time competes with efforts to raise quality, prevent harmful events, manage costs, and improve the patient experience. Across a typical 300-bed hospital, liberating nurse managers from an outdated scheduling process can free up to 6,000 nurse-manager hours annually. Nurse managers can repurpose this time for higher-order professional activities, such as mentoring, teaching, and interfacing with patients and their families to ensure highly reliable and consistent care. I’ve only made a dent in the data related to the business case for optimizing the nursing workforce, but I hope it’s enough for you to see that a top-notch workforce makes good business sense. Lillee Gelinas is Editor-in-Chief of American Nurse Today and system vice president and chief nursing officer of Clinical Excellence Services at CHRISTUS Health in Irving, Texas. Bae SH. Nursing overtime: why, how much, and under what working conditions? Nurs Econ. 2012;30(2): 60-71. Bae SH. Presence of nurse mandatory overtime regulations and nurse and patient outcomes. Nurs Econ. 2013;31(2):59-68. Dembe AE, Erickson JB, Delbos RG, Banks SM. The impact of overtime and long work hours on occupational injuries and illnesses: new evidence from the United States. Occup Environ Med. 2005;62(9):588-97. J.D. Power and Associates. National Hospital Service Performance Study. 2005. Jones CB. Revisiting nurse turnover costs: adjusting for inflation. J Nurs Adm. 2008;38(1):11-8. McCaughey D, McGhan G, Walsh EM, Rathert C, Belue R. The relationship of positive work environments and workplace injury: evidence from the National Nursing Assistant Survey. Health Care Manage Rev. 2014;39(1):75-88. McHugh MD, Kutney-Lee A, Cimiotti JP, Sloane DM, Aiken LH. Nurses’ widespread job dissatisfaction, burnout, and frustration with health benefits signal problems for patient care. Health Aff (Millwood). 2011:30(2):202-10. Old DM, Clarke SP. The effect of work hours on adverse events and errors in health care. J Safety Res. 2010;41(2):153-62. Rogers AE, Hwang WT, Scott LD, Aiken LH, Dinges DF. The working hours of hospital staff nurses and patient safety. Health Aff (Millwood). 2004;23(4):202-12. Scott LD, Rogers AE, Hwang WT, Zhang Y. Effects of critical care nurses’ work hours on vigilance and patients’ safety. Am J Crit Care. 2006;15(1):30-7. Stimpfel AW, Sloane DM, Aiken LH. The longer the shifts for hospital nurses, the higher the levels of burnout and patient dissatisfaction. Health Aff (Millwood). 2012;31(11):2501-9. Valentine NM, Nash J, Hughes D, Douglas K. Achieving effective staffing through a shared decision-making approach to open-shift management. J Nurs Adm. 2008;38(7-8):331-5. Westbrooke JI, Duffield C, Li L, Creswick NJ. How much time do nurses have? A longitudinal study quantifying hospital nurses’ patterns of task time distribution and interactions with health professionals. BMC Health Serv Res. 2011;11:319.